BBC One's big-budget drama Dickensian has been cancelled after one series. 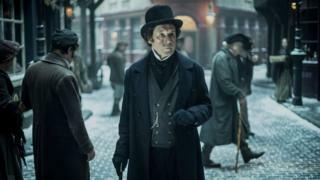 The 20-part series, based on the books of Charles Dickens, started on Boxing Day with five million viewers but it fell to an average of two million. The brainchild of former EastEnders' writer Tony Jordan, the drama brought together characters from books such as Oliver Twist, Bleak House and Great Expectations. A BBC spokeswoman said the cancellation had been a "difficult" decision. "We are incredibly proud of Dickensian and would like to thank all those involved in such an ambitious series. "We sometimes have to make difficult decisions to make room for new shows and it won't be returning for a second series." The show starred Stephen Rea as Inspector Bucket from Bleak House trying to solve the murder of Jacob Marley from A Christmas Carol, played by Peter Firth. The cast also included Tuppence Middleton as a young Miss Havisham from Great Expectations and Caroline Quentin as Mrs Bumble from Oliver Twist. But viewers complained about the lack of a fixed time slot in the schedules for the programme. Before the series aired Jordan said he had already scripted 60 episodes and was banking on the BBC commissioning more, pointing out that Dickens created in excess of 2,000 characters and he had only used 30. Jordan, managing director of Red Planet Pictures who made the drama, admitted he was "disappointed" that they would not be making a second series. "We are hugely proud of what we achieved in the first series of Dickensian and would like to thank everyone who helped us create a truly special and unique drama."